Image created for "The Seventh Ward Creoles of New Orleans," an Arts Council of New Orleans publication. View of elevated highway built on neutral ground of North Claiborne Avenue. At center, a man pulls a grocery cart. 'The Monster': Claiborne Avenue Before And After The Interstate. TriPod: New Orleans at 300 returns with part two of its highway series. This is the story of the I-10 interstate bridge that sits above Claiborne Avenue. Part one of this story was about the proposed Riverfront Expressway through the French Quarter and along the Mississippi River. That leg of the highway did not happen, and the French Quarter was saved from being demolished under a freeway. But that same year, 1968, a different section of the Riverfront Expressway did go up. Under that part? The Treme neighborhood, along Claiborne Avenue. Smith-Simmons points at what used to be the oyster house Lavada’s. “My classmates and I would put in and buy a loaf and divide it between four, five people, and you still had a nice sandwich.” Now, that property is a parking lot. Dodie Smith-Simmons stands in the parking lot of what was Lavada's, the oyster house on Claiborne Avenue she used to go to with her school mates. To make the highway happen, the state had to acquire 155 individual properties along Claiborne between Tulane Avenue and St. Bernard Avenue. The state cleared over 200 oak trees. In 1950, there were 123 businesses in this section, and almost 50 years later, just 44. One business that still stands, after a post-Katrina comeback, is the Circle Food Store. Smith-Simmons grew up in the Ninth Ward, but like people all over New Orleans, her family still came to the Treme to make groceries. Being in Circle Food reminded Dodie of the other major reason her family came to this part of town. 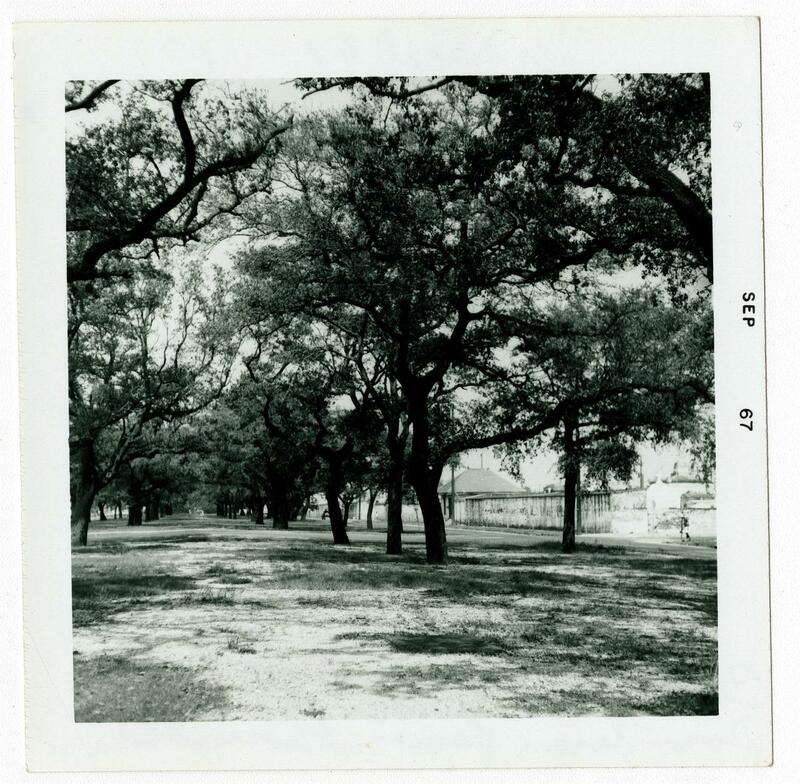 Snapshot view of Claiborne Ave. neutral ground before the construction of the I-10 overpass. Live oak trees shade a wide foot-worn path through the grass. bushes, and a neutral ground so wide people played football and baseball. It was a grand avenue, and a place of pride and belonging for the black population, especially at a time when they weren’t welcome in the neighboring French Quarter, unless they were on the job. Smith-Simmons says it’s hard to imagine an area of the city that was more significant to the black community. Louis Charbonnet is sitting around a table at Dooky Chase Restaurant in the Treme, with Lambert Boissier and Edgar Chase III, aka Lil’ Dooky. His parents, Leah and Dooky Jr. still run the business. “I was a young man at the time and we were just shocked,” says Charbonnet. Boissier’s business closed some years after the interstate went up due to a fire. Charbonnet funeral home is still up and running. Charbonnet and Boissier ran businesses alongside flower shops, insurance companies, coffee houses, hardware stores, drug stores, “any kind of business you can imagine was on Claiborne Avenue- I mean on a Sunday afternoon this was the place to be,” recalls Charbonnet. He says what was a Mecca of black-owned businesses was all of a sudden scattered around the city. So there were all these business owners, and a strong, supportive community. So why couldn’t the project be stopped? “We tried to organize some opposition to it, but it just wasn’t enough,” says Charbonnet. 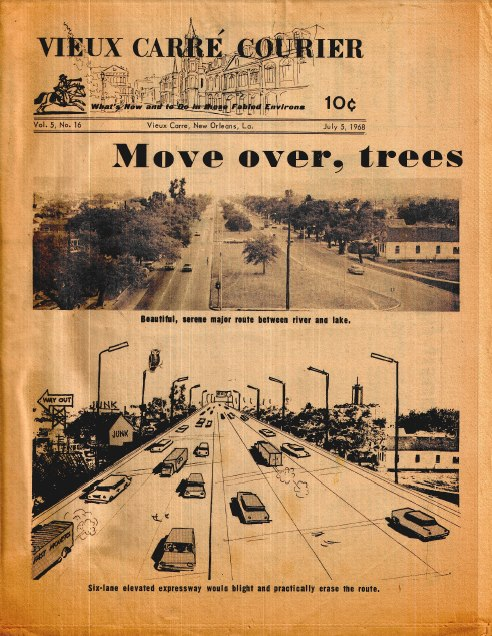 The front page of a 1968 issue of the French Quarter publication the Vieux Carre Courier, showing a rendering of the I-10 interstate to be. Within the system, there was essentially no one in government to defend the black community and communicate the cultural and economic necessity of keeping Claiborne intact. And outside the system, those who were active political organizers were busy with more pressing things. 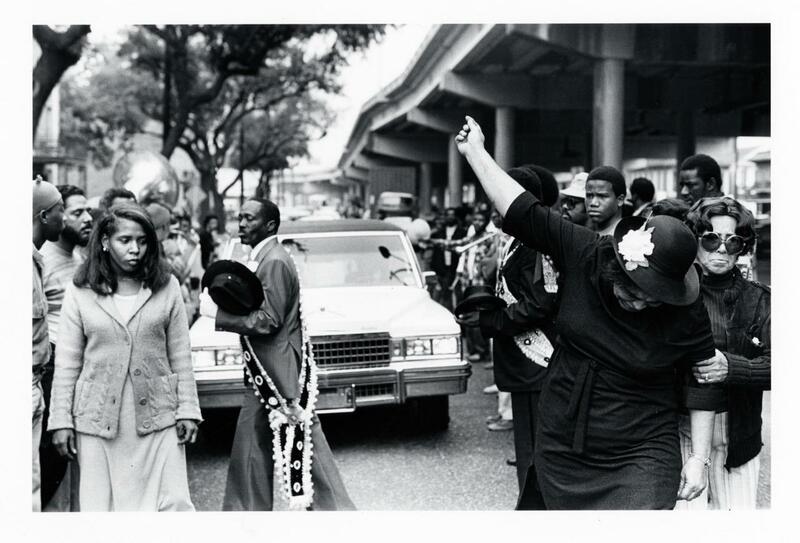 Dodie Smith-Simmons was a member of the local chapter of the NAACP, and then CORE, the Congress of Racial Equality. She says the Claiborne interstate was not a focus. In the mid ‘60s, they were working to end segregation, for the right to walk into any restaurant they wanted, go to any school they wanted, and feel safe no matter where they stood. He says by the time they realized how bad the interstate would be for the neighborhood, it was too late. That caused the black community to organize in a new way. It made them say: ’This will never happen to us again.' Charbonnet says as a result, "we’ve gotten blacks elected to positions that can represent the part we live in.” That includes Charbonnet himself, who was elected to city council in 1970, then as a state representative in 1972. Boissier was elected to city council in 1981, then went to state senate in 1999, and the constable's office 2001, where he still works today. From left: Edgar Dooky Chase III, Lambert Boissier, and Louis Charbonnet pose outside Dooky Chase's on Orleans Avenue. The idea of removing the interstate has been discussed since it went up, and regained traction after Hurricane Katrina. Some people, including many Mardi Gras Indians, and Dodie Smith-Simmons, don’t think removing the interstate will bring back what once was, and may even further gentrification throughout the Treme. But others dream of seeing the day it comes down. Evan Christopher for the opening theme music.  Catch Tripod on the air Thursdays during morning edition and again on Mondays during all things considered. To hear TriPod anytime, anywhere, subscribe to the podcast on itunes. TriPod’s also on instagram and twitter at @tripodnola. Thanks to Emma Long for research and production assistance this week. TriPod -- New Orleans at 300 revisits the first integrated high school sports contest in Louisiana, on February 25, 1965.